Today, we are going to see the best collection of hotel business WordPress themes from HermesThemes developer club. It has been built up with one click demo content import, SEO ready, WPML ready and responsive web design layout. All of these Hotel WordPress Themes are supporting 3rd party visual builder plugins such as plugins like Elementor, Visual Composer, The Divi, Beaver Builder, etc. It can be easily installable from 3rd party website and start to customize the web page layouts using live visual page builder plugins. Even you don’t need to know the coding knowledge to design your web pages! All will be done from the drag and drop elements of visual page builders. You will see more than 30+ modules ready to use on your web pages. Caballero is a bold and modern responsive WordPress hotel business theme. This theme is very simple and powerful lightweight web design to showcase hotels, rentals, motels, vacation rentals and hostel websites. 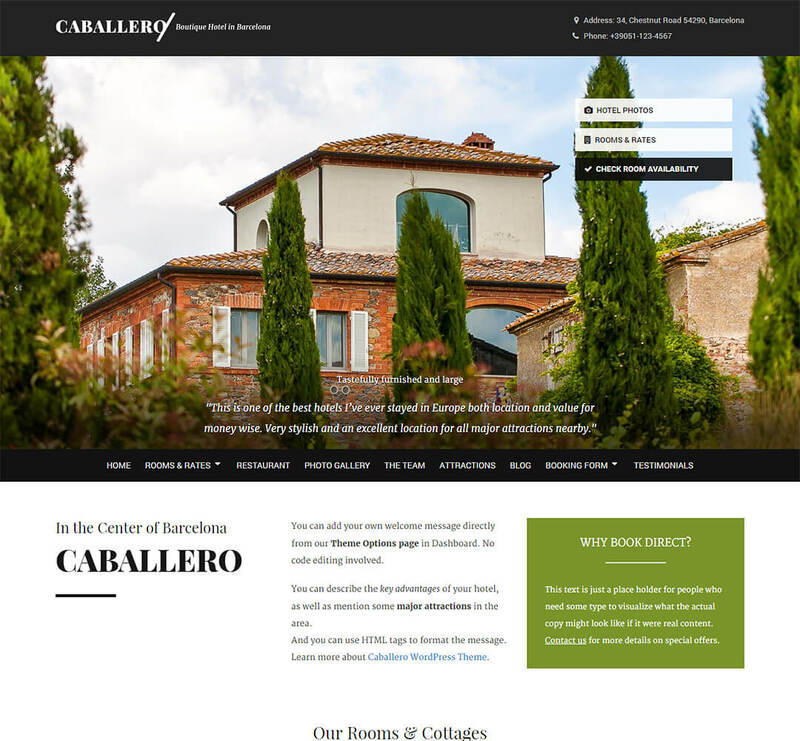 Caballero WordPress theme has been integrated with popular online booking form plugins like GravityForms and drag and drops visual page builder plugins (The Divi, Elementor, Visual Composer and Beaver Builder) support. Everything has inbuilt with Caballero theme! 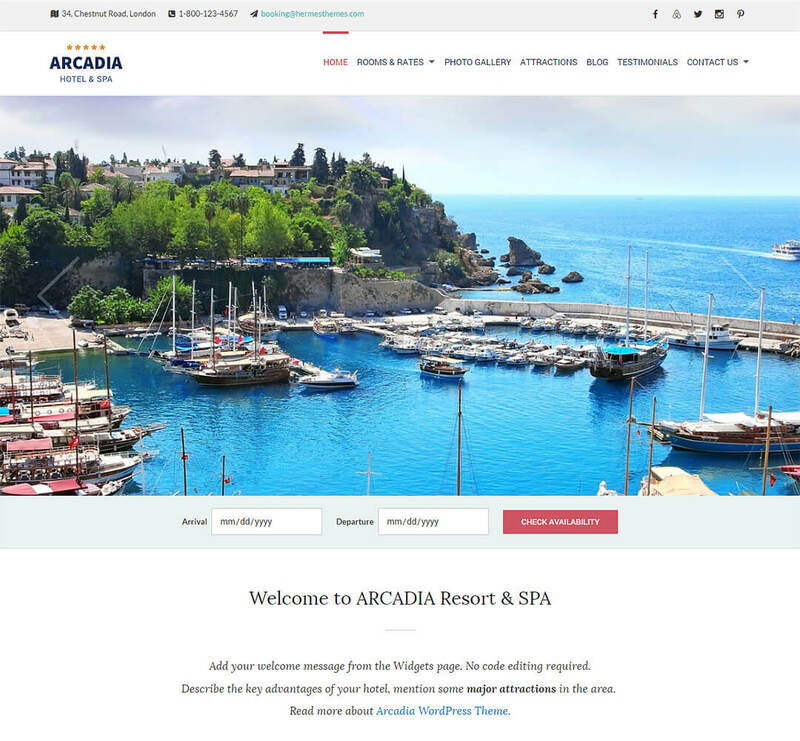 Arcadia WordPress Theme is specially designed to use for hotel and spa websites. This theme has designed with white background and large featured homepage banner to display the hotel, room, attraction to cover the visitor attention. Arcadia WordPress Theme is also coming with online room booking/reservation form. 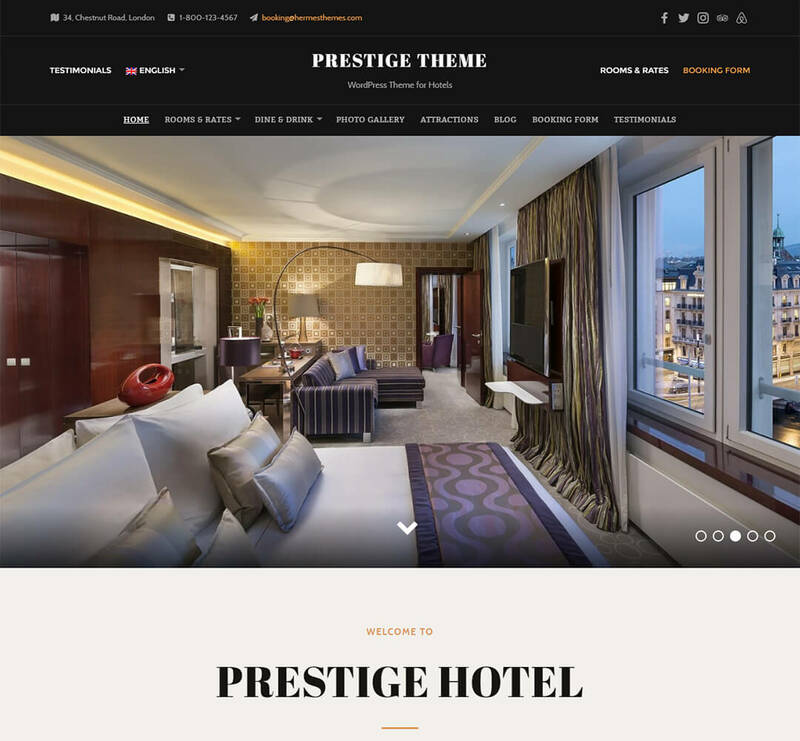 Prestige WordPress Theme is a dark and bold responsive WordPress hotel theme from HermesThemes developer club. 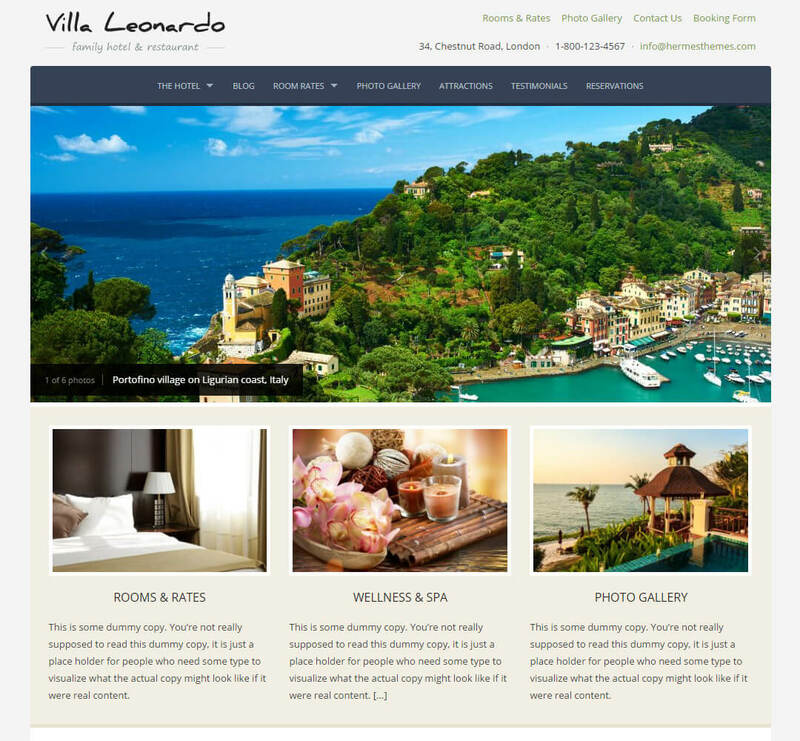 This theme can be used for hotels, resorts, hostels, guest houses, villas and boutique websites. You can simply impress the visitors by showcasing a professional business photography and clean layout. It comes with tons of features like custom fonts, layouts, styles and unlimited features. Gasthaus WordPress Theme is another great modern responsive WordPress theme for hotels, resorts, boutique B&Bs, guesthouses, etc. It comes with custom widgets to display weather report of the local area, social media profile buttons, online booking form and much more. It is also supporting with live theme customization and drag and drop visual page builder plugins. Mammoth WordPress Theme is full and fully designed to use for luxury and boutique business websites. You can simply showcase your professional photography of hotel/hostel/resort/spa/boutique/vacations/villas businesses. 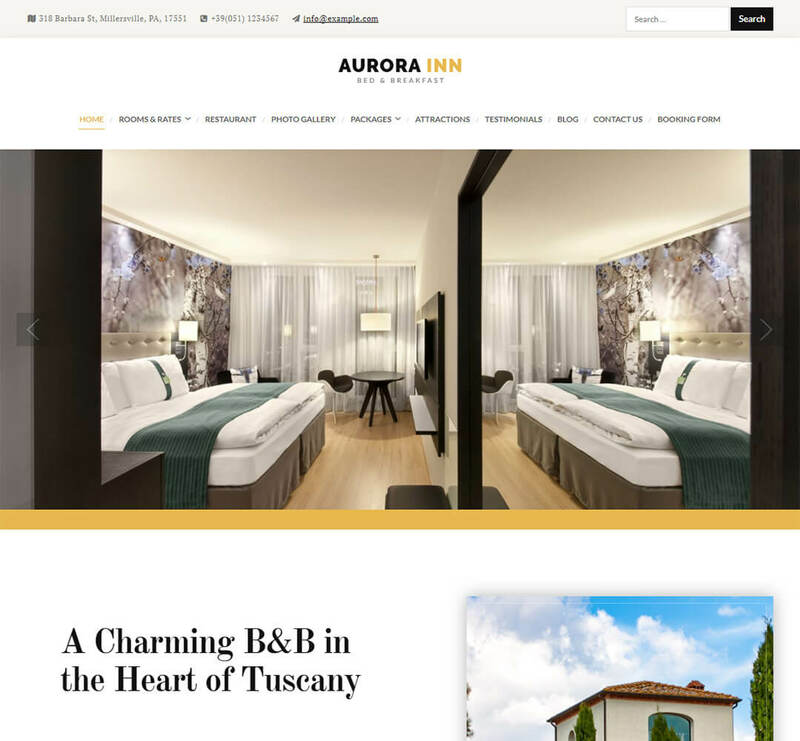 Aurora WordPress Theme is a fresh and responsive WordPress hotel theme. 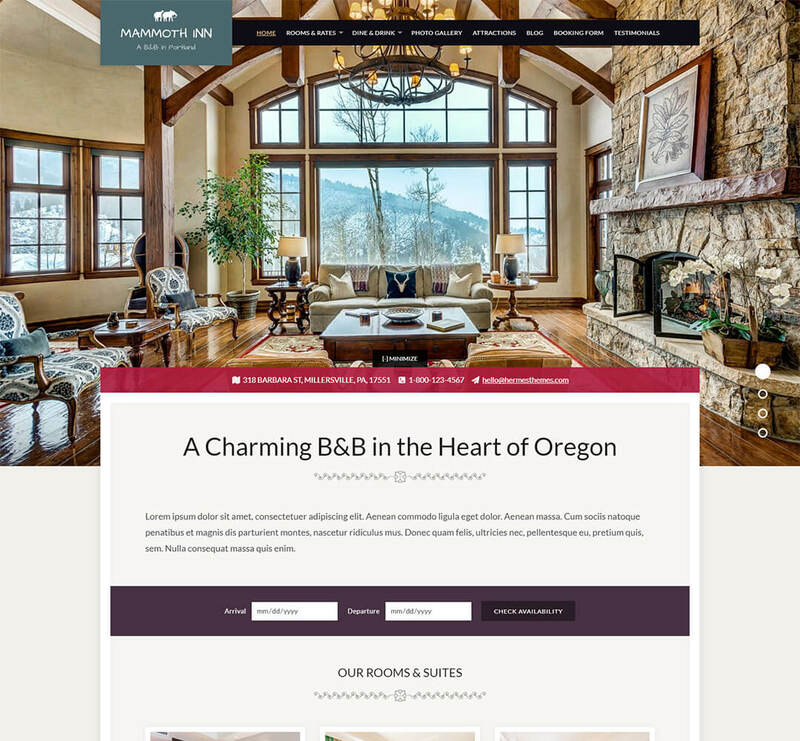 It is a clean and distraction free one column web design to showcase your hotel businesses. The design is very lightweight and fast loading on all responsive browsers and modern devices. The header comes with 2 different styles (Default layout great for hotels with smaller logos and short menus and Centered layout great for hotels with wider logos and longer menus), Flexible Rooms List Custom Page Template and much more. 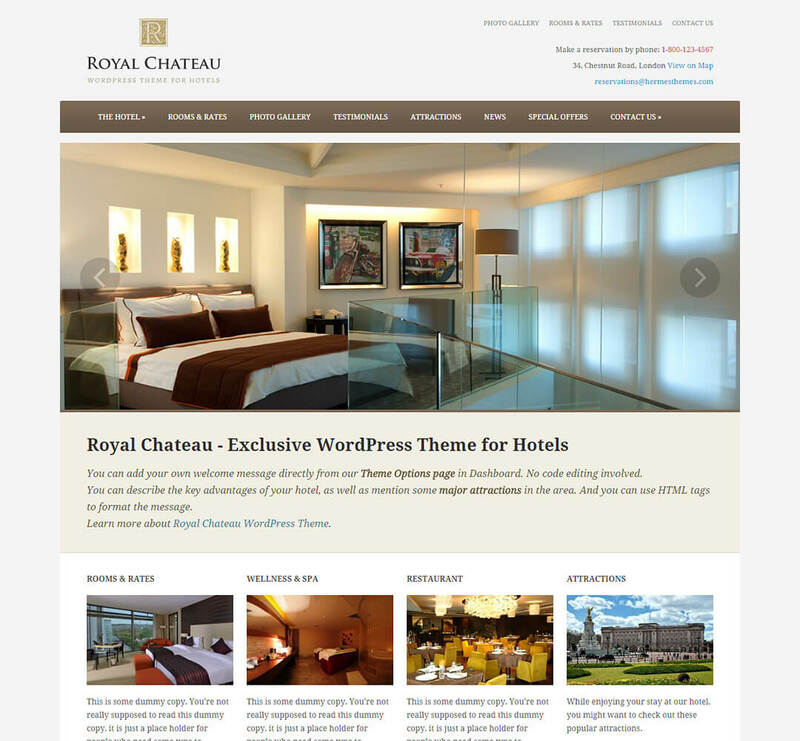 Royal Chateau WordPress Theme is a responsive web design that was specially designed to use for hotels, hostels, resorts, spas and other small business websites to showcase their services and information. Royal Chateau theme comes with one-click demo content import support, well planned and SEO ready features. The homepage design of Royal Chateau WordPress Theme will give you a professional online hotel booking or reservation platform for customers. You can showcase a number of room’s availability, amenities, and restaurant and near by attraction places to visit. Everything is customizable from backend admin theme panel options. 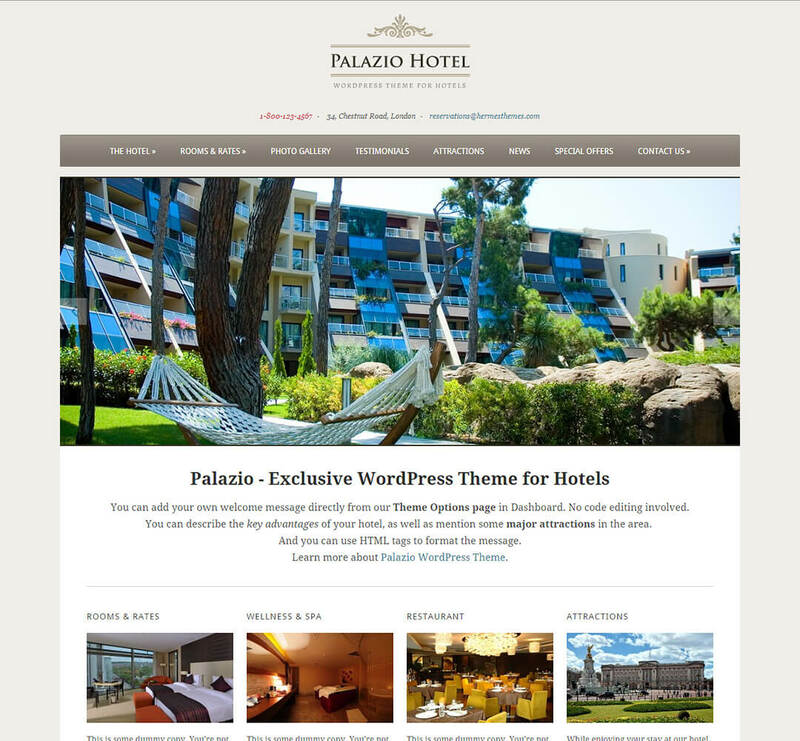 Palazio is a simple and elegant responsive WordPress theme for hotel business websites. This theme is coming with a neat and responsive approach on smartphones, desktop, tablets and laptop devices. Palazio WordPress Theme would be the best choice if you were planning to create a simple online hotel booking website with respective features. 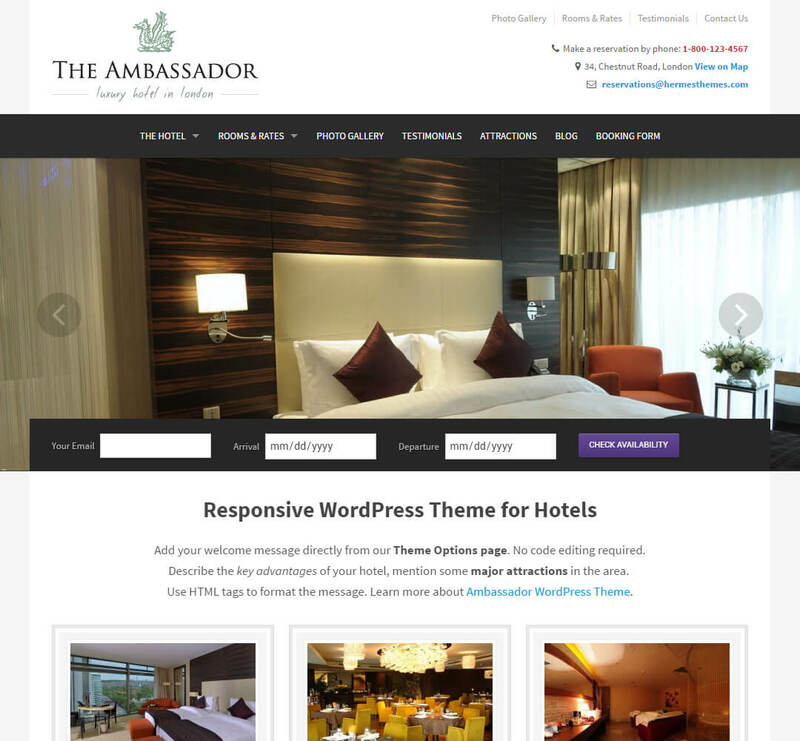 The Ambassador WordPress Theme is a modern responsive hotel business website design from HermesThemes club. This theme comes with some unique design approach to showcase your hotel rooms, interior and exterior photos/galleries with lightbox features. 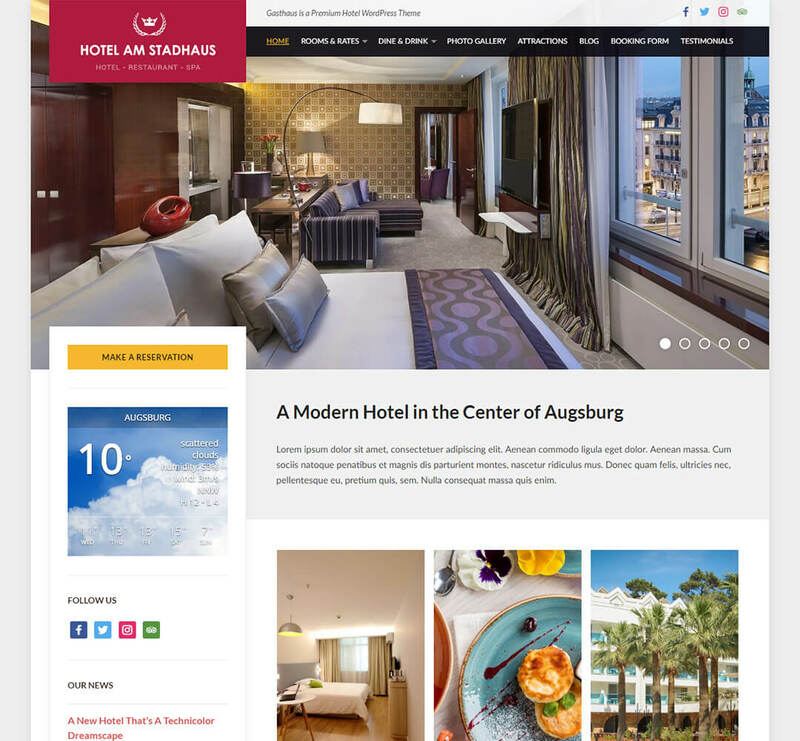 Additionally, The Ambassador WordPress Theme comes with a clean looking white background and full-width photos to highlight your hotel’s beauty and styles. Even you can integrate the booking form on homepage slide show banner as well. Majestic WordPress Theme is simply awesome and creative hotel business web design that comes with plenty of amazing features to showcase your hotel rooms, rate card, photography and near by attraction places. The Majestic theme has all features to showcase any type of business websites, such as hotels, hostels, spa, and hospitality businesses. 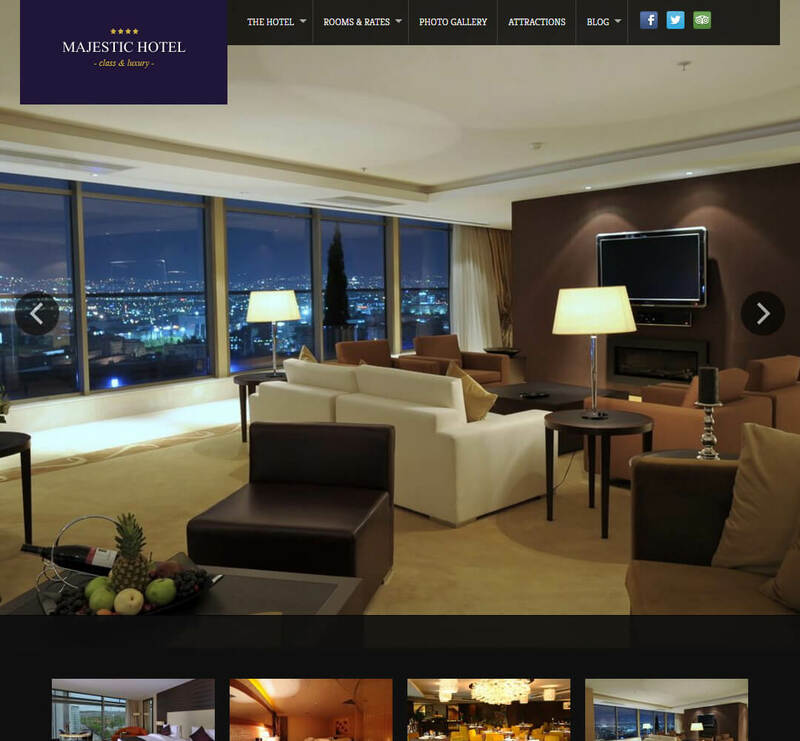 The homepage design of Majestic WordPress Theme comes with a large full-screen banner to display your full view of hotels and rooms to magnetize your visitors. Metropolis WordPress Theme is a classy and fully responsive web design layout for hotel business websites. This theme will help you to showcase your hotel business information in a classical way and design approach. 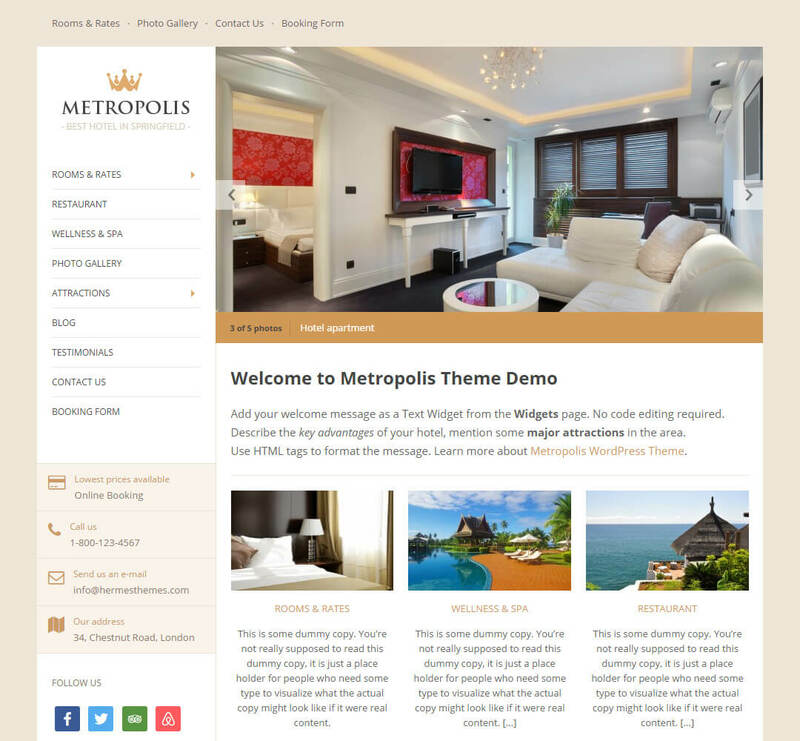 The design of Metropolis WordPress Theme will be very classical and easy to navigate all hotel pages. The layout is fully responsive and SEO ready! Castello 2.0 is the updated version of Castello WordPress Theme from HermesThemes developer club. This theme is perfectly designed to use for private villas, holiday homes, holiday apartments and small to large-scale business websites. 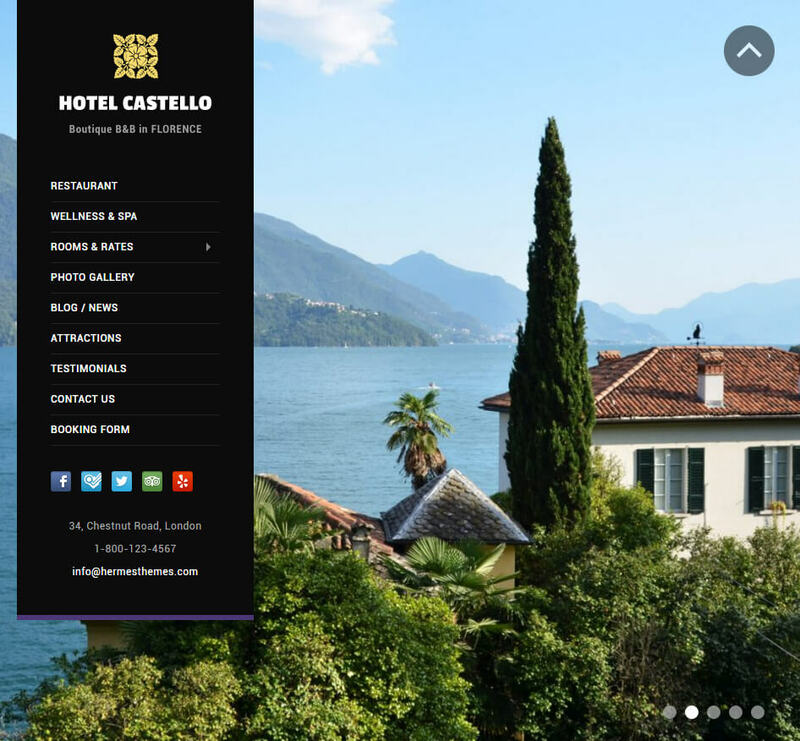 Castello 2.0 WordPress Theme flatteringly focuses on full-screen photography will keep your visitors engaged with your content. Leonardo WordPress Theme is another great responsive web design from HermesThemes club. This theme is coming with 2 columns classic layout and responsive layout. Leonardo WordPress Theme gives you live theme customizer and create an infinite number of color schemes and font combinations. Generally, it can be used for family hotels, restaurants, booking rooms and other great features of hotel websites. 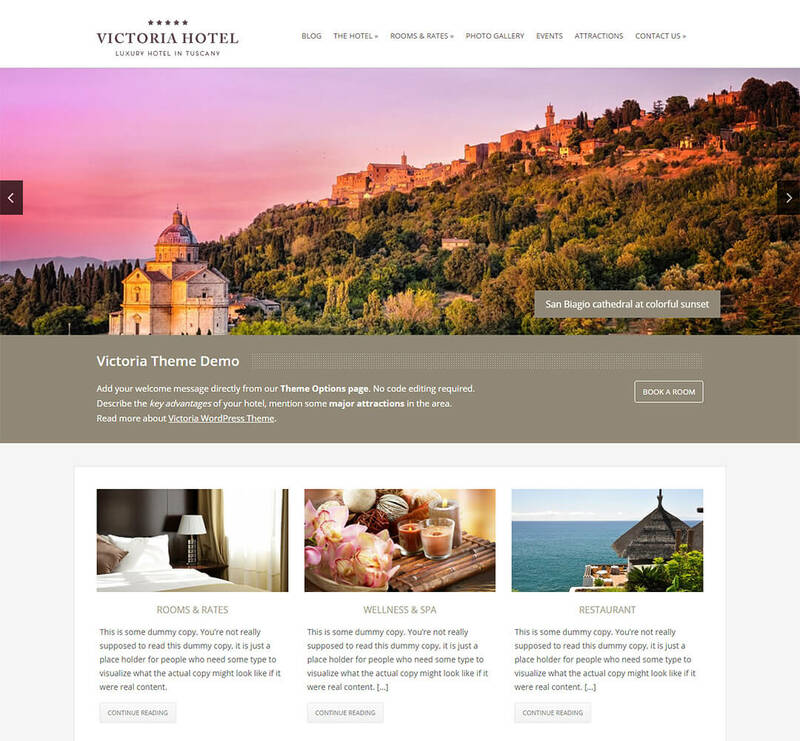 Victoria WordPress Theme would be the best choice if you were planning to design a website for luxury hotels. It comes with all necessary features to showcase your hotel rooms, gallery, attraction, spa and etc. 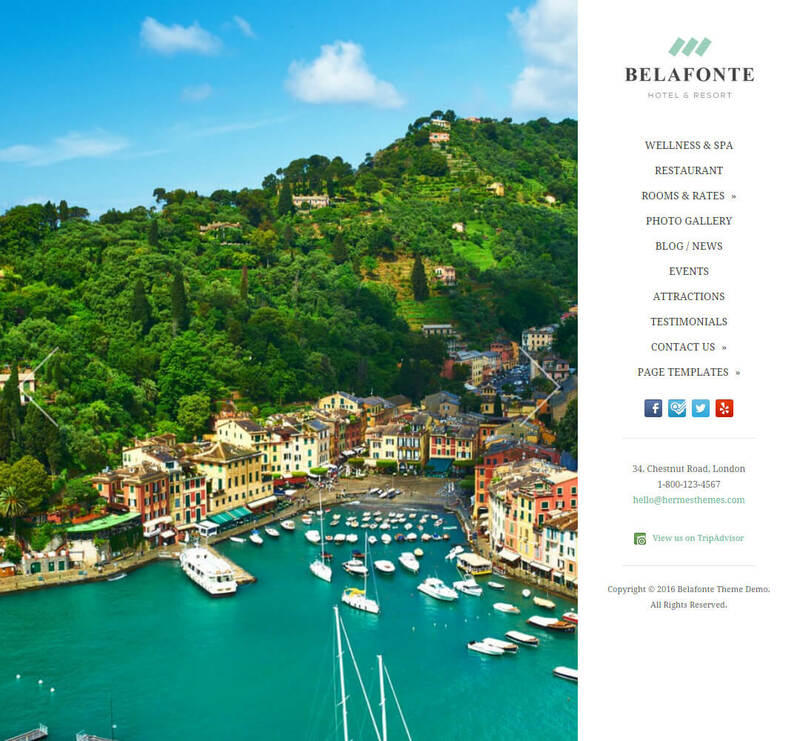 Belafonte WordPress Theme is a modern and minimalistic responsive hotel business web design. It is a great choice for luxury rental villas, resort hotels, boutique hotels, B&Bs, etc. The design is very simple yet powerful to display your hotel business information in one page or multiple page designs. 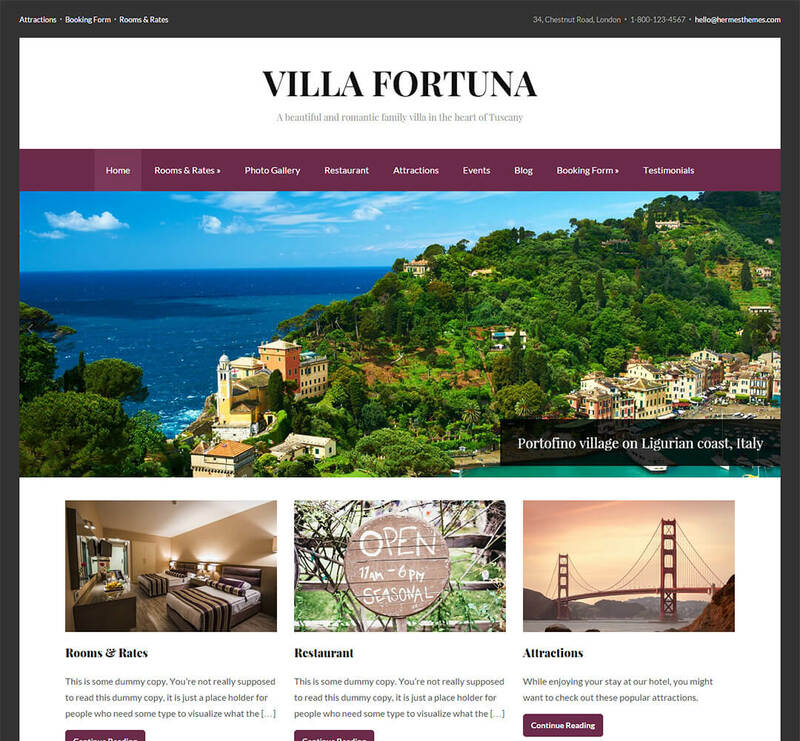 Fortuna is a bold and responsive hotel WordPress theme that comes with plenty options, such as light and dark skins to showcase your hotel photos, gallery, and testimonials. Fortuna WordPress Theme will suit for all kind of hotel business websites. Imperial WordPress Theme is a responsive intuitive layout that comes with easy customization options. It is a modern design to display your hotel information for visitors. 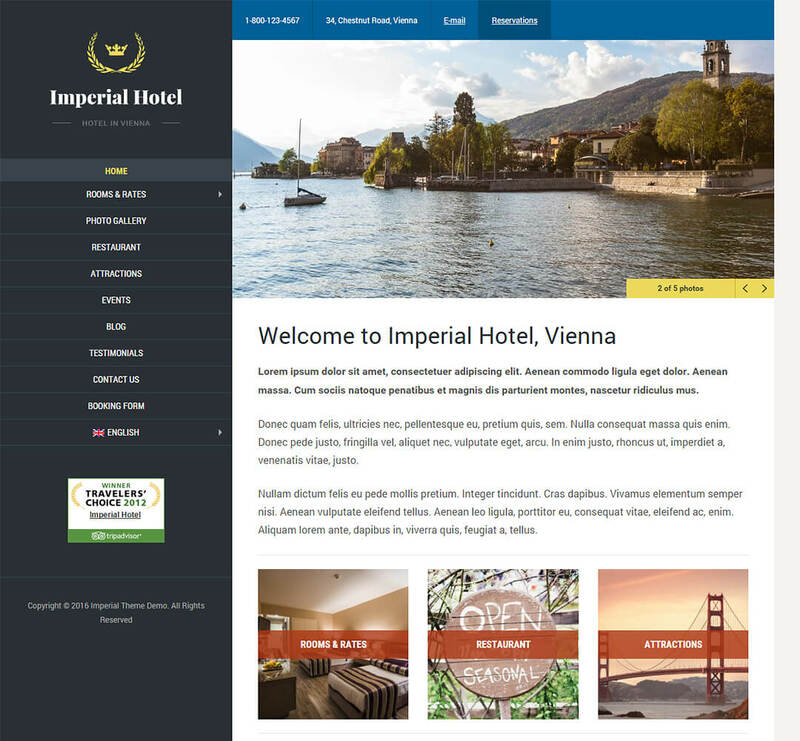 You can brand your business name using Imperial WordPress Theme! 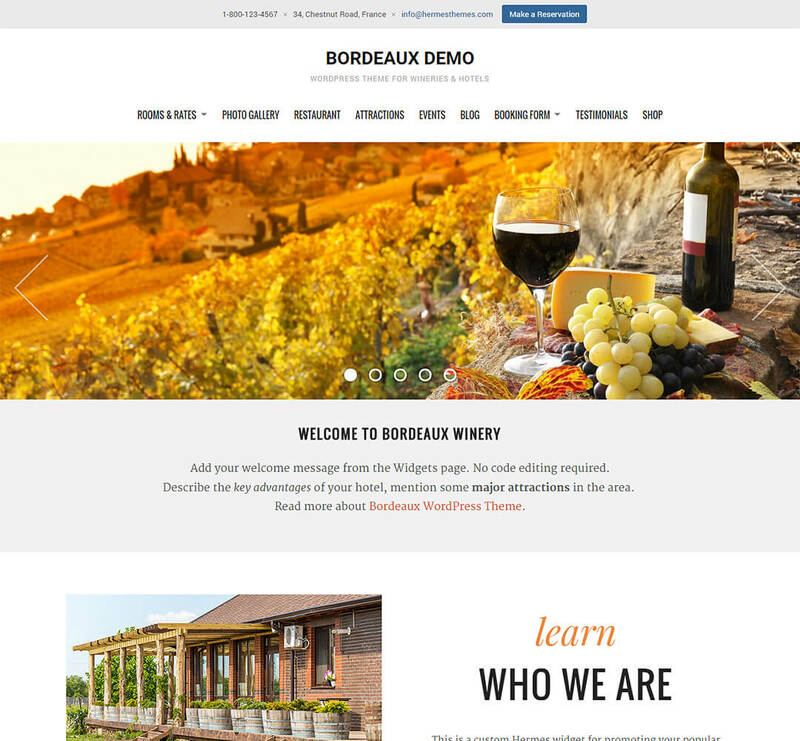 Bordeaux WordPress Theme is a pleasant and a wide layout to showcase your hotel businesses. It comes with custom widgets that allow creating a unique homepage in just a couple of minutes. It is also integrated with 3rd party plugins like WPML, WooCommerce, The Events Calendar, GravityForms, etc. 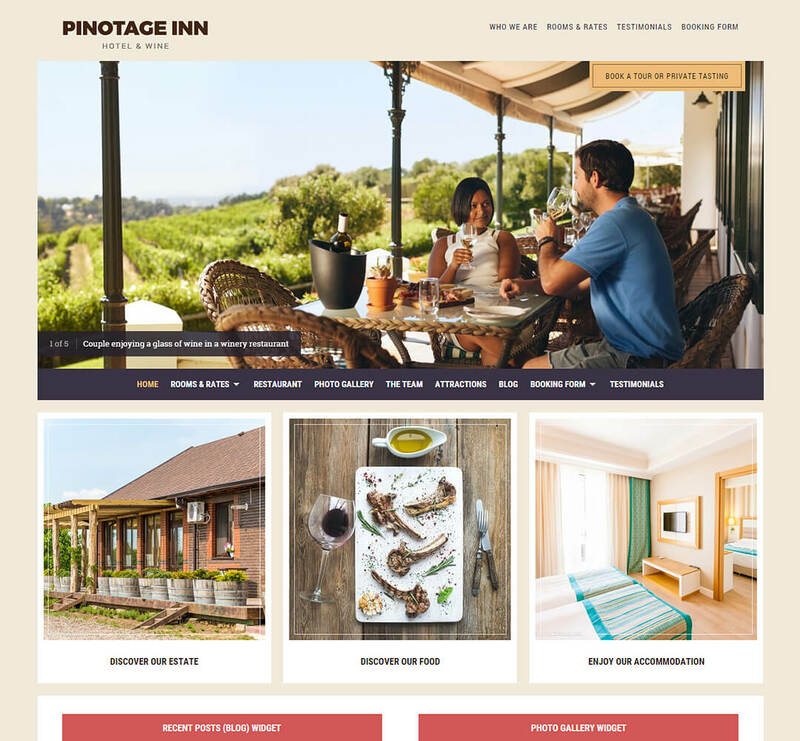 Pinotage WordPress Theme is a modern and clean responsive web design for hotel business websites. It can be generally used for hotels, wineries, booking online rooms, restaurants, and villas! Pinotage theme is also coming with some pre-built page templates to use directly from the backend posting options. It is compatible with popular booking plugins, WPML, The events calendar and GravityForms plugin. 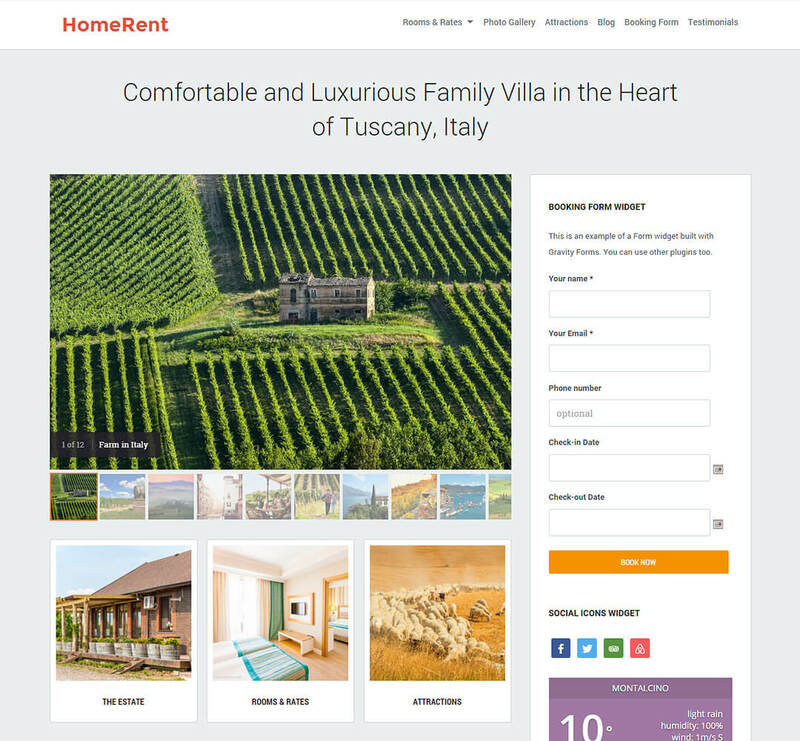 HomeRent WordPress theme is particularly designed to use for vacation, home rental, villas, hotels, hostels, spa and all type of hotel business websites. The homerent theme is also supported to use like a single page hotel website. PrevPreviousUnderwood WordPress Theme for Personal Bloggers!